Sennheiser has signed an exclusive distribution agreement for North America with K-Array, a PA loudspeaker and amplifier manufacturer based in Florence, Italy. 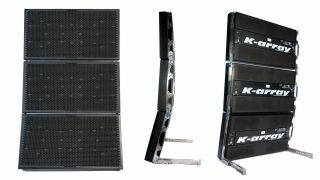 K-Array's light and intelligible speaker technology is best exemplified by the new KH4 self-powered, two-way, flat panel line array. K-Array's ultra-compact and powerful flagship KH4 delivers consistent, high-quality audio in long throw applications. Weighing less than 104 lbs. and measuring 44 inches wide by 24 inches high and just 6.3 inches deep, the system can produce 145 dB SPL. The vertical coverage pattern is variable between seven and thirty-seven degrees, with a 120-degree horizontal coverage pattern. The KS4 self-powered, dipole subwoofer is just 6.3 inches in depth and weighs 82 lbs. An internal DSP module controls the KH4 mid/high pack and the KS4 subwoofer. The speakers may be computer controlled remotely using dedicated PC software.